McGahuey was the last person to be executed in the Gas Chamber in Oregon. 21-year-old Gloria Davy, 20-year-old Pamela Wilkening, 20-year-old Mary Ann Jordan, 21-year-old Suzanne Farris, 24-year-old Nina Schmale, 23-year-old Valentina Pasion, 22-year-old Marlita Gargullo and 20-year-old Patricia Matusek are raped and killed by 25-year-old mass murderer Richard Speck aka Born to Raise Hell in 2319 East 100th Street, Jeffery Manor, Chicago, , United States. 23-year-old Corazon Amurao hid under a bed and escaped the massacre, she identified Speck due to the 'Born to Raise Hell' tattoo on his forearm. 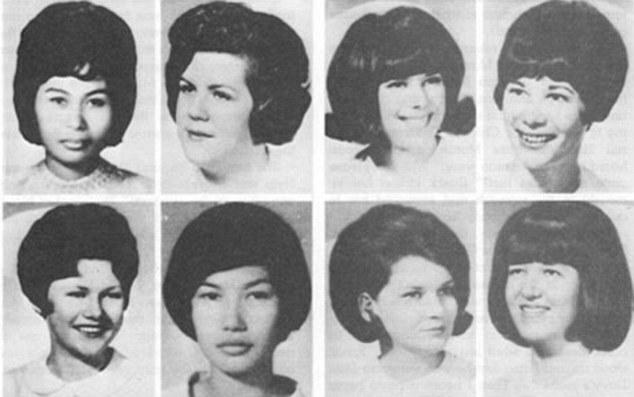 Photographs of the eight nurses were the basis of 'Eight Student Nurses', a 1966 painting series by Gerhard Richter.